"In Lai Chau ben ik iets gaan eten. Aangezien hier weinig toeristen komen is het weer simpel voedsel. Ik laat mijn kopie zien, dat zegt dat ik geen vlees, vis en gevogelte eet. Men vraagt mij wat bepaalde woorden betekenen, Dit weet ik dan niet, want ik spreek en lees geen Vietnamees. Dus men laat rijst, groente en eieren zien en ik knik dat dat goed is. En even later krijg ik dit dan voorgeschoteld. Simpel, maar wel lekker. Daarna ben ik gaan rondlopen. Onderweg kwam ik bij een bruiloftsfeest langs. Ik vroeg of ik een foto van de bruid mocht maken en wed gelijk uitgenodigd. Men bood mij thee, rijstewijn en snoep aan. Ik werd ook uitgenodigd voor de lunch. Maar aangezien ik net gegeten had en men bovendien praktisch geen Engels sprak (ik had zelfs moeite met de leraar Engels), heb ik dit afgeslagen en ben weggegaan. Morgen de volgende etappe naar Dien Bien Phu." Lai Chau - is located in the northwest of Vietnam and was formerly one of the poorest region of the country. 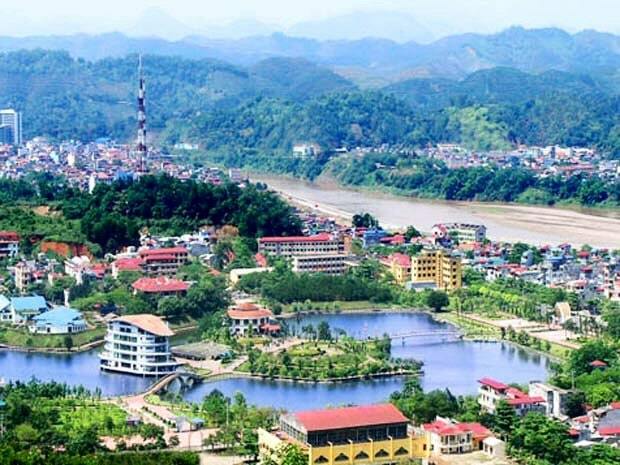 Lai Chau is the name for the province and its capital. The city was formerly known as Tam Duong and nowadays it has an eight-lane boulevard and monumental government buildings, which appear as a kind of bizarre mirage. Lai Cau was known as a "one-horse town", a remote and unimportant town, but progress has also been introduced here. There are ATM's and there is even a KFC. The economy is growing gradually in Lai Chau. The most products, which are produced here: liquor, bricks, cement and electricity. The surrounding landscape of the city has green conical peaks and as enchanting as ever. This landscape is home to many minorities of North Vietnam and South China. Lai Chau is a place where it is good to stop when you drive or reverse from Sapa to Dien Bien Phu. Obviously Lai Chau is also ideally suited as a base to discover this part of Vietnam. In the city there is a monument to Ho Chi Minh surrounded some of his collegaes. The roads in the city are in good condition and it is not as crowded with traffic as in other places. However, you may have a problem if you want to rent a motorcycle. You can try the best at Karaoke in Tran Phu Street in the city. Normally it fails to rent a motor, but here you can try it. They are very easy here. Especially in Lung Toen and Can Ho, the road goes through a beautiful valley between the hills and large rice fields. Another good idea is to visit the Nam Long area. There is a large concentration of ethnic minorities. Many people from the Thai and Hmong live here. There is also a large market on Sunday in San Dao (50 km from the town of Lai Chau). You can also meet people from the Hmong and Dao. It is difficult to see so many people together from different tribes in the early foggy morning in colourful clothes. Seen from above, the market looks looks like a flower with thousands of colours. The goods, which are traded here, are the local specialties such as chicken, pork, honey, rice, tea, etc. Someone says. "If you want to look at the unique local market, you can see what the ethnic minority in the mountainous culture has to offer." You can also take a trip on a motorcycle to the Tien Son cave. This is about an hour's drive from the city. If you want to make a longer motorbike ride, you can go to the Ho Sin city. This is 80 km away. You are driving on a road between beautiful hills and the views are worth it. 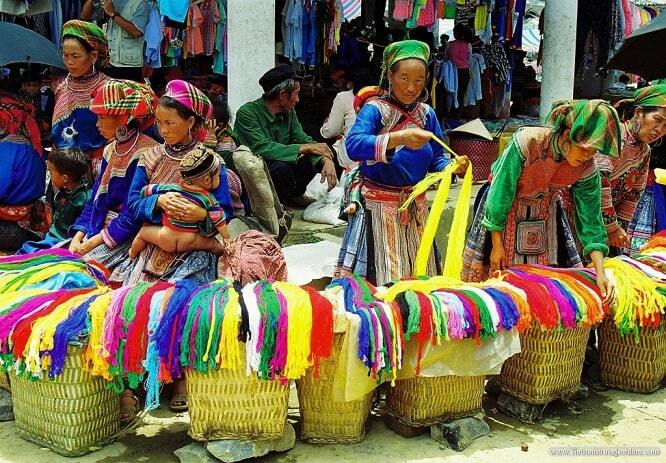 There is a market on Sundays in Sin Ho, where many women from ethnic minorities come to (Flowers, Blue, Black Hmong, Lu Dao), so you can buy a lot of interesting souvenirs or you can try a tasty snack. On the road from Lai Chau to Sin Ho you'll pass the Nam Long the region, where a beautiful complex of 10 caves is: Pu Sam Cap, which is 1,700 meters above sea level. It is recommended to visit the first low-lying cave because it is easily accessible. Around Sin Ho is also the old, dilapidated, historical Deo Van Long palace. It is now in ruins. Deo Van Long was the French leader of the autonomous Tai Federation (now: the Lai Chau province). 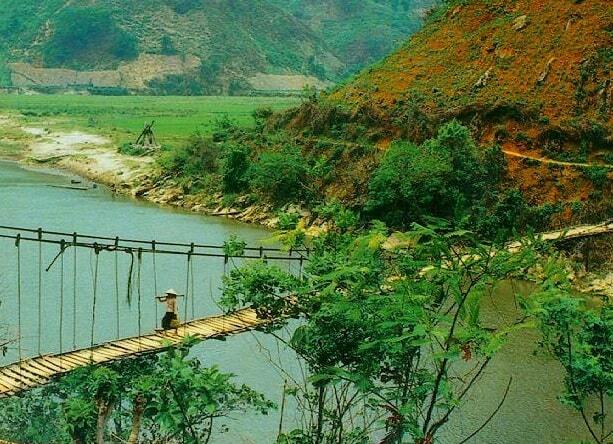 Hoang Lien National Park is a large wooded and mountainous area, which lies between the towns of Sapa and Muong Lay. It's the perfect place for ecotourism and hiking and visiting ethnic villages. In some villages it is also possible to make use of a host family (home stay). In this park are primarily villages of the ethnic group Hmong, Dao and Tay. Hoang Lien Park is very rich in flora and fauna. There live a lot of different types of protected animals. Lai Chau town located about 70km from Sapa. Between Sapa and Lai Chau you can use local buses, which cross the Tram Ton Pass (beautiful trip). Ask for it at your hotel or at the information centre in the town. 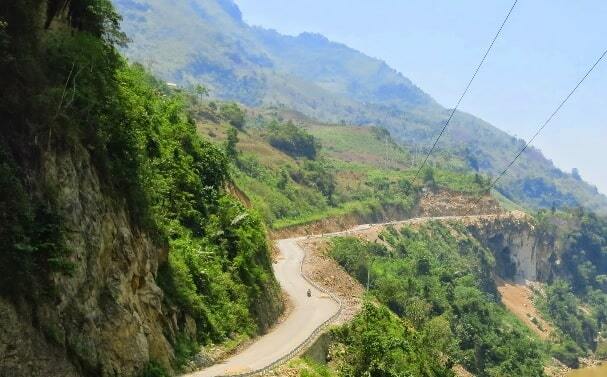 It is no problem to go from Sapa and Lai Chau by motorcycle. There is a good, direct bus service between the towns then Bie Phun, Son La, Mu Cang Chai (Yen Bai), Sapa and Lai Chau. There is no train in the province of Lai Chau. From Lai Chau and Hanoi also operate night buses Hung Thanh Travel. The journey takes about 14 hours.. The distance to Hanoi is 450 kilometer.